In the Toolbar Extras plugin and here on its website there are used quite a few terms specific to this Admin Bar. So I made to little overview graphics to give you a better impression and to get the whole thing visually. What is the “Build” group? Where is the “New Content” group, Site group and all this stuff located? 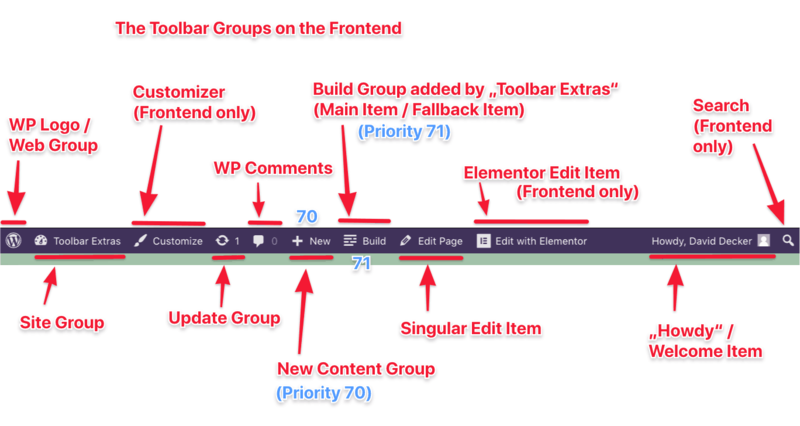 Toolbar Extras currently adds only one real top-level item, that is the “Build” Group – and within Toolbar Extras wording this is labeled as the “Main Item”, if a page builder is active (registered, activated), as “Fallback Item” otherwise. Elementor dynamically adds three items if needed – one for editing its supported post types (“Edit with Elementor”), one for its “Inspector” (if activated in Elementor > Tools) and one for the “Maintenance Mode” (if “On”).